We are an Australian company who build and develop websites for casino clients who develop and maintain portals within the online casino gambling indsutry. All websites we create focus on conversions and assisting our casino clients maximize the potential of their lead generating businesses. Below is some of our featured client work we are most proud of. 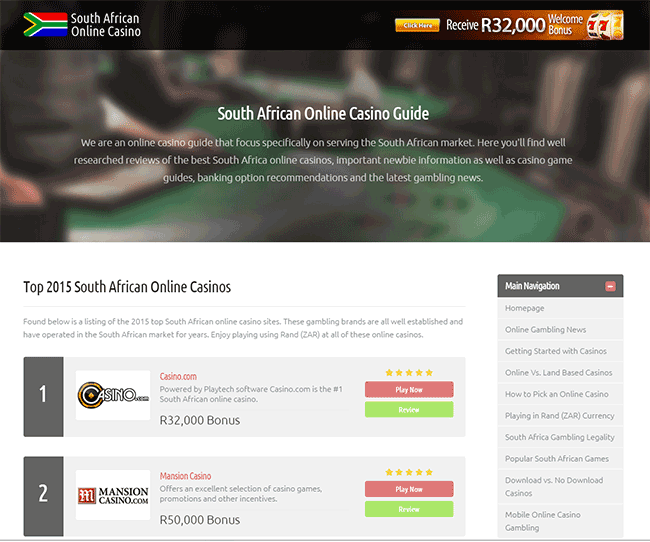 We're very proud here at Two Spots of the work we've done on South Africa Online Casino. We've helped them increase conversions by 10%, while introducing a rock solid new set of new layouts and designs for the website. Here at Two Spots we put our online casino clients needs above all else. Our goal is to ensure our casino clients are happy and most importantly that the work we do leads to a better all-around performing website. From aesthetics, design and usability to speed optimization and effective delivery across all devices and platforms, we strive to ensure that we only deliver the best of the best to our casino clients. We work closely with all of our clients to assist them in meeting their objectives and goals. Our capabilities at Two Spots are quite diverse and are not limited only to web design. We also have in-house capabilities to build out entire platforms, management systems, etc… depending on the requirements and needs of our casino clients. If you’d like to learn more about Two Spots click the button below to visit our about us page for more info.